One of our favorite meals is brunch or what we call “brinner”. On special occasions, I love to make something special for Dara and the girls. While we love french toast and we absolutely are lovers of Nutella, I thought that I’d make something in between. 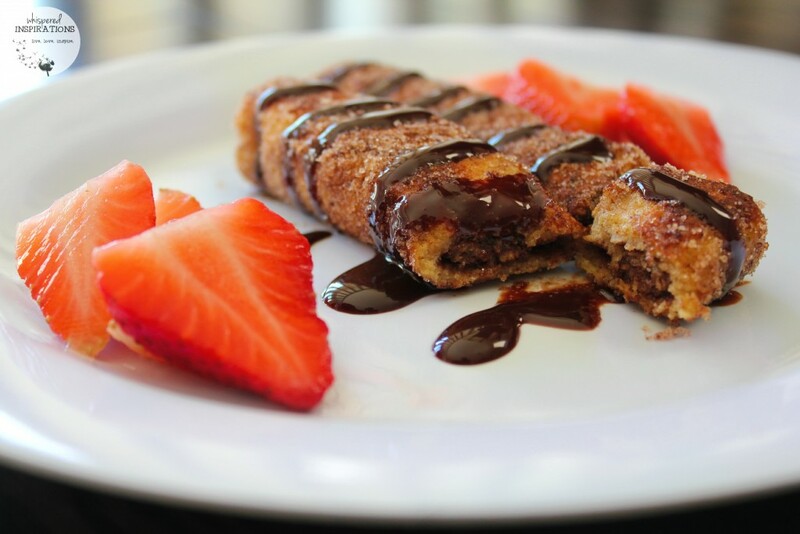 The result: Breakfast Nutella Churros. This is sure to become your next favorite dish and that is not an overstatement. All you need is bread, eggs, stevia, cinnamon and your favorite toppings. Don’t forget the Nutella. You can thank me later! 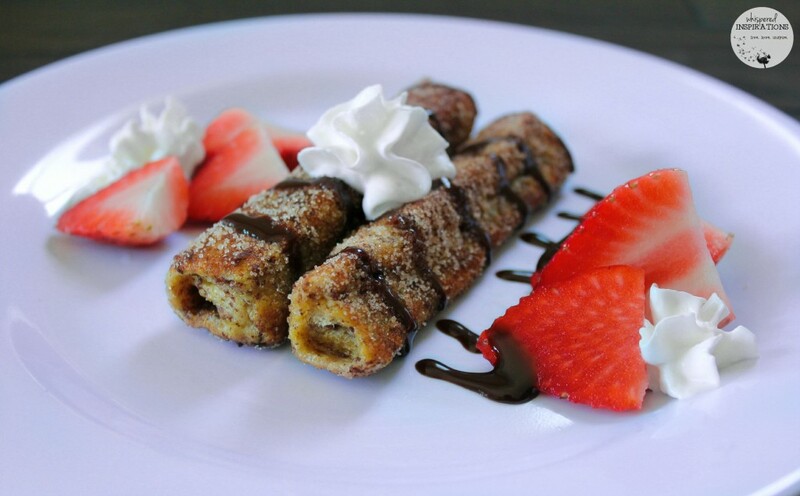 A delicious french toast churro. Coated with cinnamon and stevia and topped with chocolate syrup, strawberries and whipped cream. 1 rolling pin or sturdy glass. Place your cutting board down on your counter. Take your whole wheat bread and using your kitchen scissors, cut the crust off. Try to make it so that it is a perfect square or as best as you can. Take your rolling pin or sturdy glass and roll your bread as flat as you can. In a bowl, prepare your egg mix. Break the eggs into bowl, add cinnamon to taste and a pinch of nutmeg. Set aside. On a flat plate, add your stevia, cinnamon and mix until blended. Set aside. On cutting board, take your butter knife and spread Nutella evenly on the face of the bread. If you opt to add fruit on the inside, this is your chance. Just add it in the center of the bread in a vertical line. Heat up oil or cooking spray in frying pan on medium heat. Once completed, begin to roll the bread tightly until it is closed. Take your roll and dip it into your egg mix, cover evenly. Place roll down on frying pan with the edges down first. Pretty much where you can see the line of where the bread ended when it was rolled. Flip onto other side or roll accordingly to where it needs to be cooked. Remove from heat and immediately roll in your stevia/cinnamon mix until fully coated. Top with your favorites, serve and enjoy! This is a great dish for special occasions. I surely do not recommend it as an everyday meal! Have fun and enjoy. Making this dish is super simple. When I shared this with the rest of my family, they were shocked that it was regular whole wheat bread from a loaf. I love the things that are simple yet genius and not to toot my own horn but, this one just happens to be. The best part is that you can get creative. You can add some chopped up bananas inside the breakfast churros or you can change up the filling. My husband wanted peanut butter and jelly and that’s what I made for him. You can have fun with it and it’s guaranteed that your kids will love it. Now, breakfast doesn’t have to be boring. While I wouldn’t make this every day, it is best reserved for special occasions, holidays or a random “just because’ kind of day. It can be on the sweeter side so, it makes a great treat. Remember, everything life is better with bacon–so when you make breakfast churros, go all out! 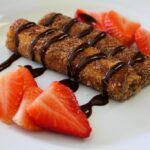 Grill that bacon, have some eggs and have these Breakfast Nutella Churros to finish a great breakfast or brunch. Need more inspo? See the amazing things you can do with Nutella! Food coma will be induced. What are your favorite things to have for breakfast or brunch? This looks delicious! Printed and Pinned, thanks for posting! My pleasure, thanks for sharing. These sound so good. Great for our next brunch to mix things up a bit! They are a hit in our home. These look so incredible, and perfect for strawberry season as well. Yes, hope you enjoy them when you make them! I am glad they liked it! OMG, YUM! I want some of those right now. Delish! This looks heavenly, but I don't know if I'd have the patience to place them on the plate so pretty. I'd just pop them in my mouth! Thanks, they are pretty tasty! This is delicious,the grandkids just love it! Those look ans sound like a amazing brunch treat. When I make this for the grandkids,seems there is never enough bread to fill them up…so delicious! Aww, I am glad they like it.